IoT is one of those buzzwords that’s been thrown around so much that it’s become largely synonymous with disappointing marketing hype. Still, home automation, in principle at least, has a lot of potential. The ESP8266 chip came out about two years ago, and it’s been drawing a lot of interest from the “maker” community. This inexpensive chip, for those who don’t know, incorporates a wifi module, flash memory, and a small 32-bit Xtensa core in a tiny package. This has had many people excited, because it means all kinds of electronic projects can be connected to wifi networks for only a few dollars in hardware cost. I’ve known about the ESP8266 for a while, but until now, it wasn’t so interesting. Early versions of the chip had only a handful of I/O pins. You also needed to install some clunky SDK provided by the vendor to program it, and the instructions were not straightforward. Think tons of dependencies and lots of boilerplate code. Thankfully, this isn’t the case anymore. It’s now possible to get a NodeMCU module on eBay for less than $3.50 shipped, or $7 on Amazon. This module has many I/O pins, its own 3.3V voltage regulator, its own USB interface for programming, and best of all, is programmable with the Arduino IDE. I’ve recently completed two projects with the ESP8266. One of them is a wifi-enabled power outlet that can be remotely switched on and off. 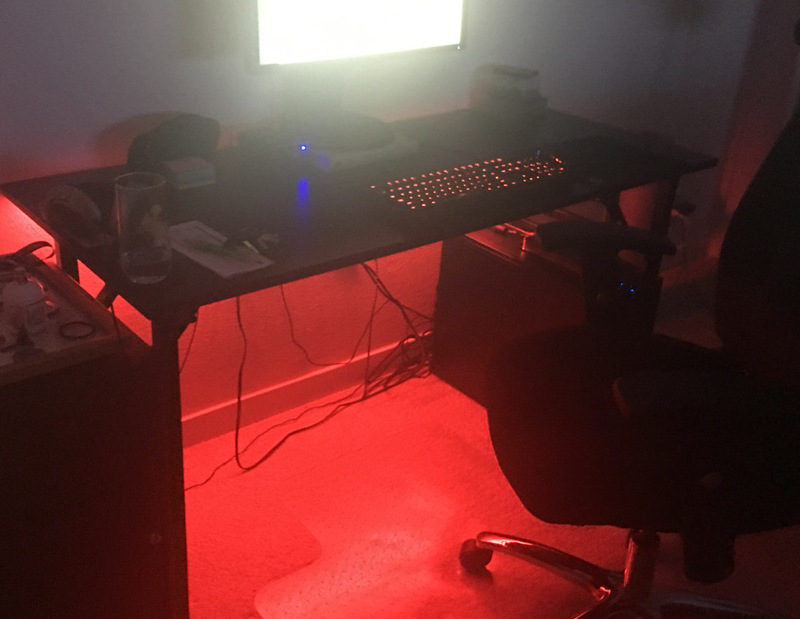 The other is an RGB LED strip whose color can be changed remotely. I work with a Linux machine at home, and needed to update my udev rules in order for the USB interface of my NodeMCU modules to be recognized so that I could program them. Besides that, the whole process has been almost seamless. I intend to play with more of these in the future. There are now LED strips with individually-addressable LEDs, which seems like a lot of fun. I would also like to make a box with temperature, light and motion sensors that I can query remotely. If you’re interested in working with the ESP8266, I personally recommend buying a NodeMCU instead of a bare module. It will make your life much, much simpler. It is also worth checking micropython and the wimos boards. Micropython is quite a lot of fun on the board. pps. It’s not an ARM, it’s a tensilica core. Another core that’s even cheaper than ARM. It is kind of quirky but, as you noticed, still great gcc support. Thanks for pointing that out. Will edit the post. Nice build! I love these little ESP8266 NodeMCU Modules! I run two as a temperature sensors around my house. One of them has an OLED display that shows the temperature of the sensor.